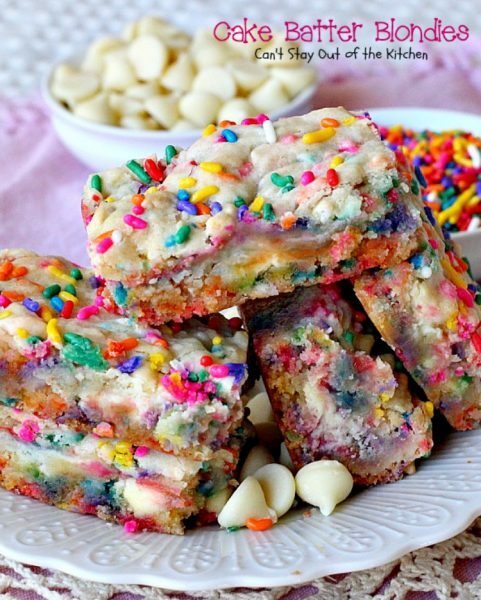 Cake Batter Blondies are a wonderfully, decadent, amazing little brownie. This one is so simple, and it uses only a few ingredients. It uses white chocolate chips to make it rich, and the cake or cookie decorating sequins (rainbow sprinkles) in the batter to give it bursts of color. It is a dense, gooey bar that is spectacular in appearance as well as taste. If you’re looking for easy, economical, quick, delicious, and a brownie (blondie) without nuts, this is it! I made up a batch of these jewels to take to the daughter of some friends who was in the hospital, pregnant, and with a special needs baby (due to heart problems) that they were having to monitor for the last few months of her pregnancy. They were so delighted to get a batch of these lovely blondies and gobbled them up quickly. It gave us an opportunity to reconnect with her parents who we hadn’t seen regularly in years, which was really nice too. I will say that it’s not normally easy to find white chocolate chips. Kroger carries their private selection label of them–and that’s the only place in the metroplex I’ve been able to find them with regularity. You can also purchase them at Trader Joe’s if you have one in your area. When I first made this recipe in September 2012, I was still learning the elements of having a food blog. My pictures were really blurry, even if I was trying to learn how to present them better. I remade this recipe in October 2014 and I’ve remade it again (February 2016) because I still wasn’t satisfied with the pictures. This time I sent a batch of Cake Batter Blondies with Creamed Cabbage Soup and Savory Party Bread to friends when they had their first born child. Let me share a few tips for getting this recipe just right. You cannot double the recipe and put it into a 9×13″ baking dish. It just won’t turn out. 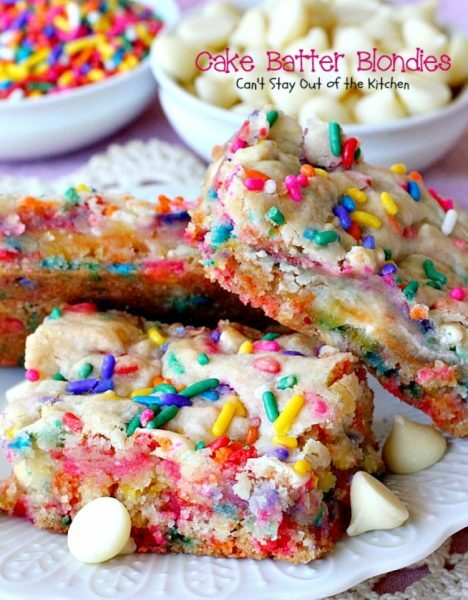 The white chocolate chips will dissolve into the dough (because you have to bake it so much longer) so they completely lose their texture and you will also end up overcooking the recipe so it looses its distinctive gooeyness. Bake a single batch in either a 9×9″ or an 8×12″ glass baking dish about 20-30 minutes, depending on your oven. Try not to bake any longer than that. (If you need a double batch use two baking dishes). Remember these are supposed to be very moist and not dried out when you cut into them. When you insert a toothpick into the center it won’t have goo on it when you bring it out, but you will be able to tell that it’s just barely cooked through. This is a fabulous dessert even if it can be a little high maintenance getting it just right. Give it a try and you’ll see what I mean. 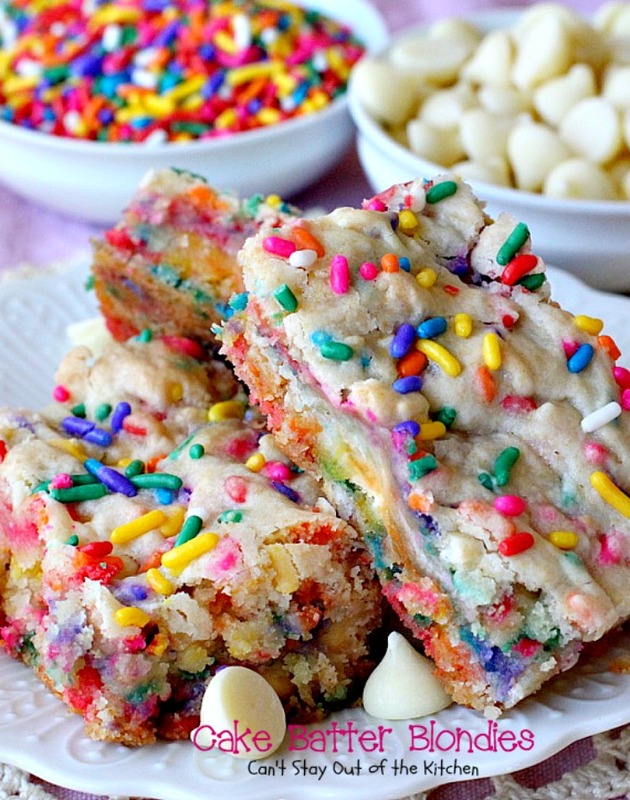 Cake Batter Blondies are ooey, gooey and delicious. 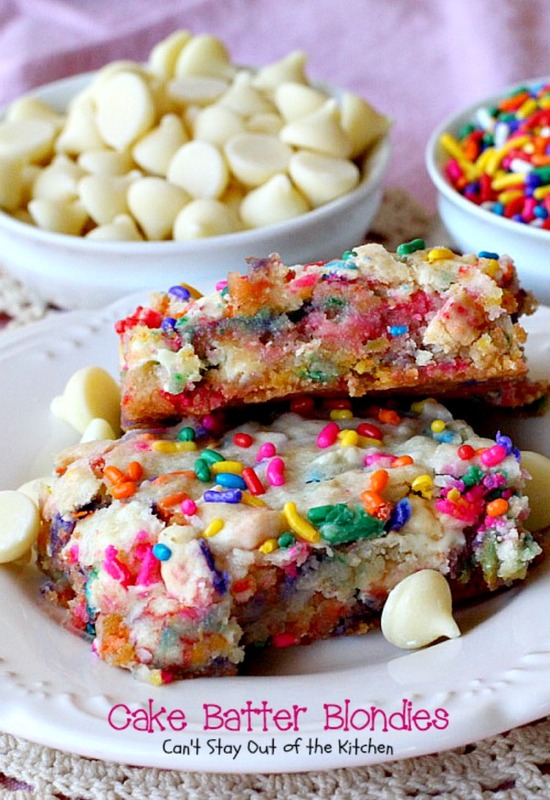 Cake Batter Blondies are filled with sprinkles and white chocolate chips. 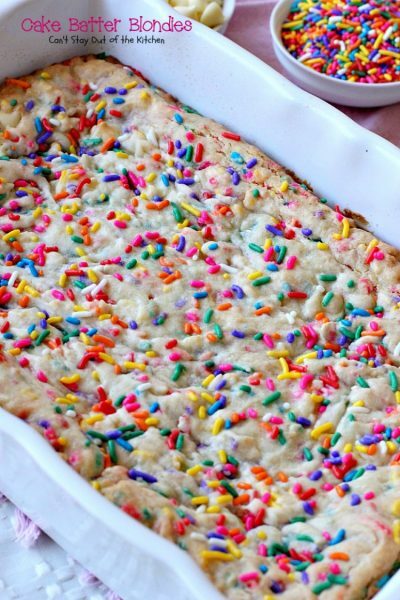 This is a great dessert for tailgating parties. 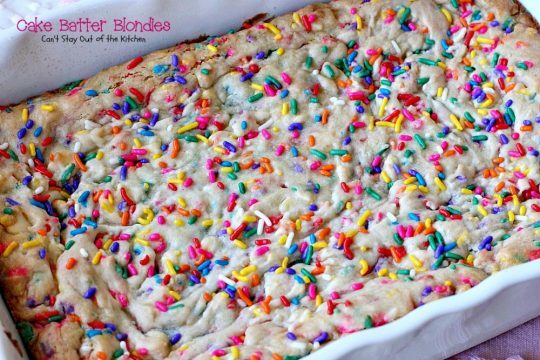 Everyone raves over these luscious blondies. I used these ingredients. I prefer using a white or golden vanilla cake mix for this recipe rather than a yellow cake mix. 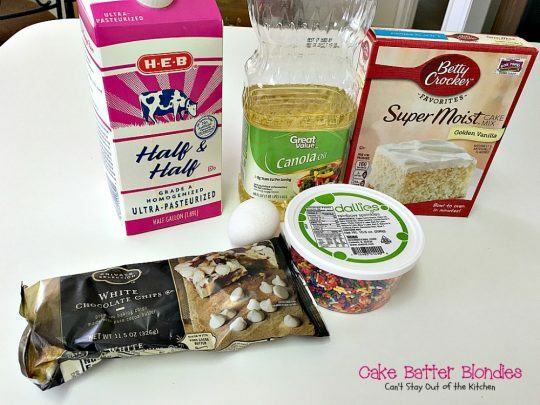 Place cake mix, sprinkles, egg and oil in a mixing bowl. Stir to combine. Mixture will be dry. 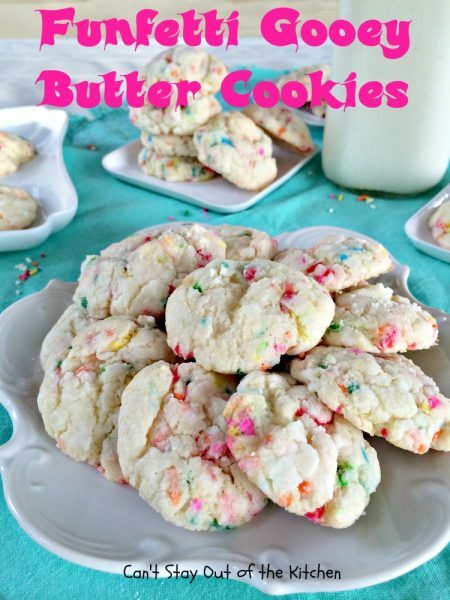 Add half-and-half cream and white chocolate chips. 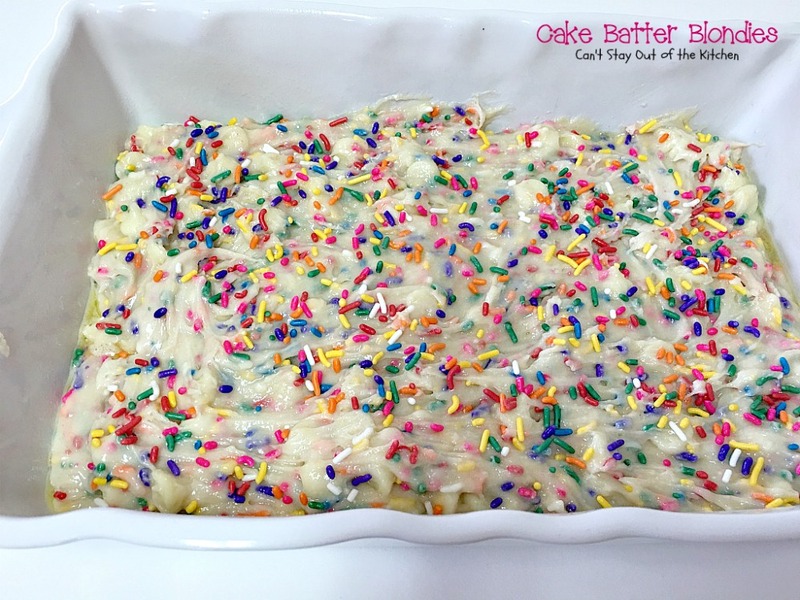 Grease a 9×9″ or 8×12″ baking dish and spread batter into prepared pan. 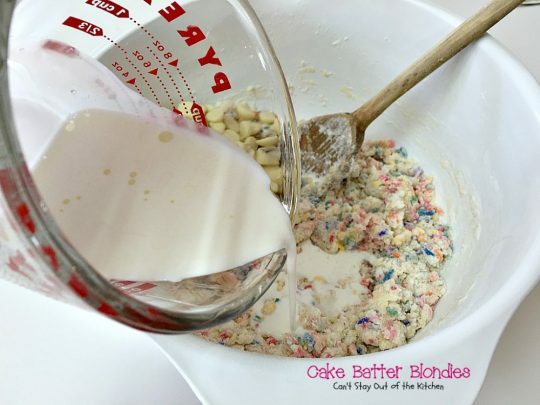 Sprinkle with 2 tablespoons sprinkles. Bake at 350 for about 20-30 minutes or until a toothpick inserted in center comes out clean. I recommend cooling the bars completely and even refrigerating them before cutting into bars. Cake Batter Blondies are great for Christmas baking too. Just purchase green and red funfetti. 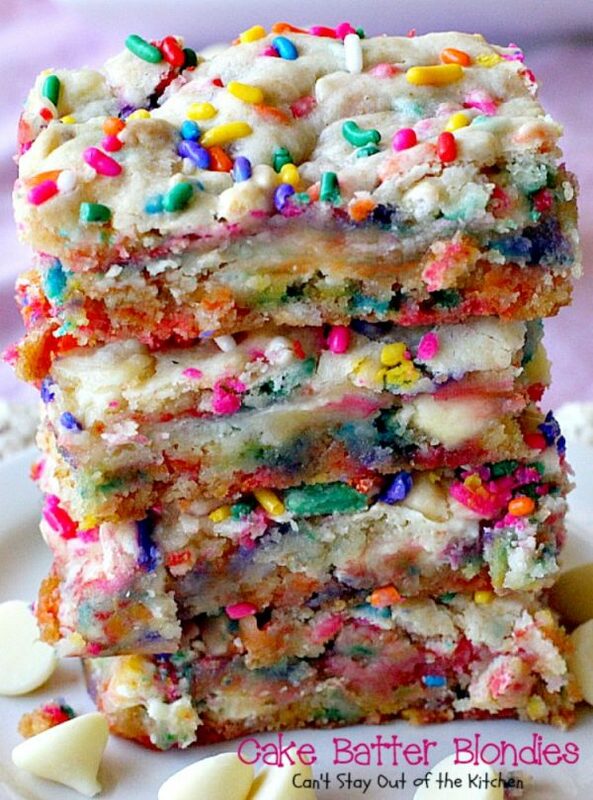 Cake Batter Blondies are so easy to make up because they start with a cake mix. 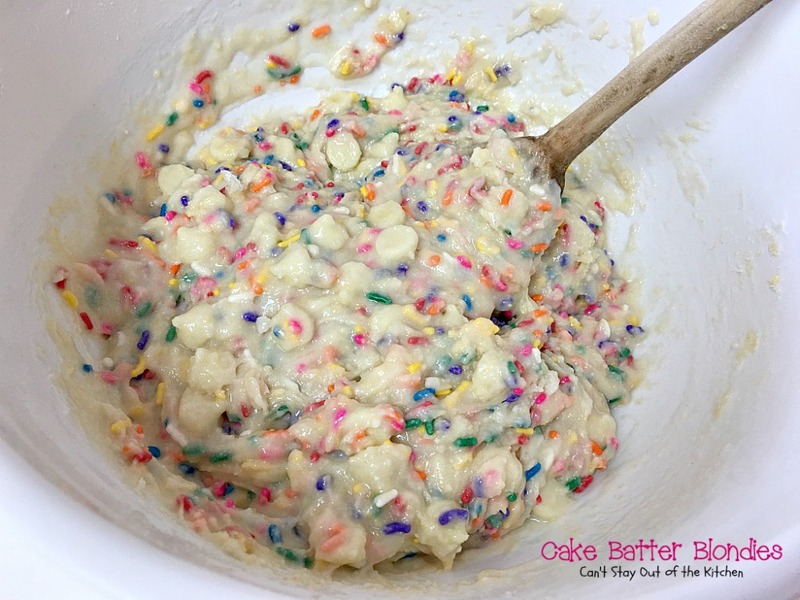 You can use either white chocolate chips or vanilla chips in this batter and both turn out wonderfully. Take a batch of these to your next potluck and you will come home empty-handed! Cake Batter Blondies are ooey, gooey and delicious. 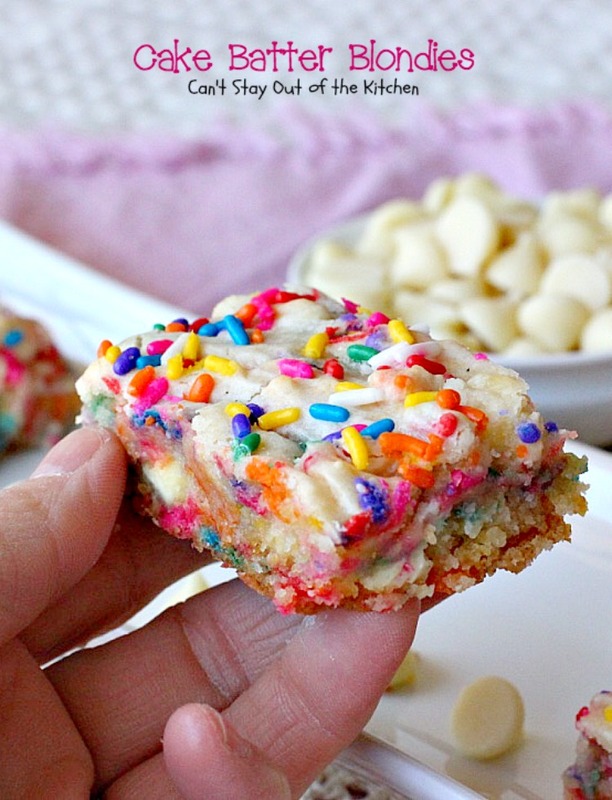 These lovely bars start with a cake mix and use white chocolate chips and sprinkles. Combine the cake mix and ½ cup sprinkles in a large bowl. Add oil and egg and stir to combine. Stir in the cream and white chocolate chips until the batter is combined. Place batter in a greased 8x12” or 9x9” baking dish. 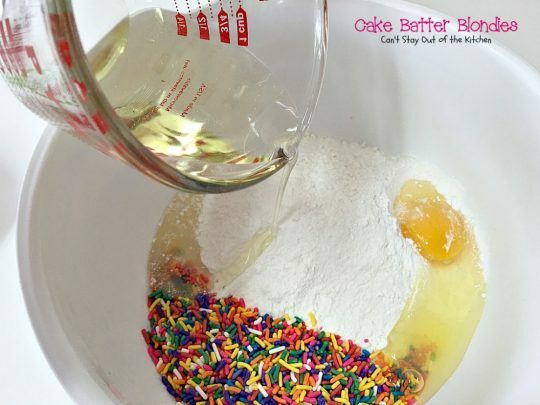 Sprinkle with 1 tablespoon rainbow sprinkles. Bake for 20-30 minutes or just until the edges turn golden and a toothpick inserted in center comes out clean. NOTE: You may want to refrigerate these bars before cutting if they are too gooey. NOTE: This recipe does not work well being doubled. The batter has to cook too long so the white chocolate chips dissolve into the dough rather than retaining their shape. Additionally, the bar ends up overbaking. Place batter in a greased 8×12” or 9×9” baking dish. You may want to refrigerate these bars before cutting if they are too gooey. [br][br]This recipe does not work well being doubled. The batter has to cook too long so the white chocolate chips dissolve into the dough rather than retaining their shape. Additionally, the bar ends up overbaking. 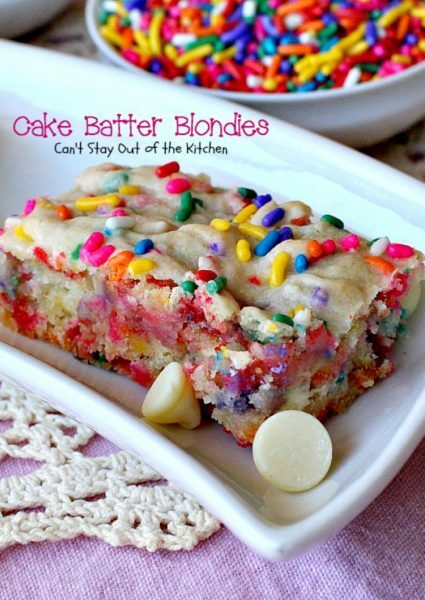 Don’t Cake Batter Blondies look scrumptious?? These were AMAZING! I was looking for a dense, moist cake batter flavored blondie. Tried someone else’s recipe last week and it was too cakey. 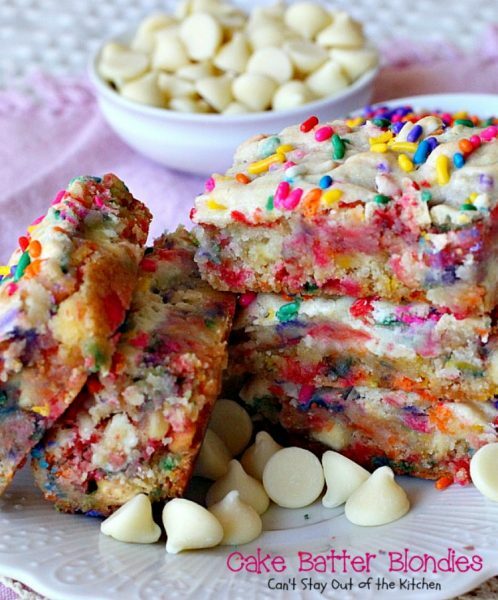 But this recipe…OH MY GOSH! The best, I knew the minute that the dough was so dense that these would be exactly what I wanted! Even better with Vanilla funfetti frosting! Hi, Rebecca! Yes, I’m sure they are so rich with vanilla funfetti frosting! Sounds like a winner to me. So glad you enjoyed these goodies. Have a great weekend. For those of you at high altitude (I live in Colorado Springs, just under 7,000ft), I added in an extra egg, baked at 375 degrees and set the timer for 15 minutes. I checked with a toothpick every couple minutes after that and the total cook time wound up being about 22 minutes. One question for the author, is it common for this to sink in the middle while it’s cooling? Hi, Jennifer. Yes it is common for the blondies to sink in the middle while cooling because they are just barely baked all the way. Hope you enjoy the blondies. these did not turn out well for me!! the sprinkles turned the batter brown & they did not taste good either!! You cannot use any of the sprinkles with the dark blues, purples or greens or they do turn the batter an awful color. I use the sprinkles with whites, yellows, pinks and oranges and those seem to work out fine. Not sure why they didn’t taste good unless you undercooked them. Each oven is different and it’s really hard to get these to the right balance of being cooked enough but not overcooked or undercooked. My blondies turned purple when I added the half and half, it seems the color on some of my sprinkles turned the milk which turned the batter! I’m sure they’ll still be good by how did you prevent that??? Hi Ashley. I think I used the sprinkles without the deep blues and purples (white, pink, yellow, orange, light blue and light green). I’ve had that happen to me before so I avoid them unless I’m adding them in something dark like brownies. They won’t effect the taste of the blondies, just the appearance. Hi, Jessica. Yes, an 8×8 will work fine. You may have to adjust the baking time slightly because the dish will have more dough. Otherwise, it might be like cookie dough in the center. Enjoy. I am curious! I live at high elevation (5,000 ft) and wasn’t sure what the changes would be for me when making these yummy things 😍My best friend just made them in NC, and said I MUST try them. Hi, Rosie, my sister and all her kids and grandkids live in Colorado Springs, CO. My niece is the real baker there. I think she usually has to decrease the sugar content by about 1/4 cup. You can probably also find info online that will tell you what you need to do in baking at those high temperatures. Hope it turns out for you, it’s a terrific recipe. I made these yesterday and they were absolutely AMAZING!!! I used red white and blue sprinkles for the 4th of July and they are beautiful! So glad you enjoyed them Jessica. I love the beautiful red, white & blue colors! Have a great Fourth of July weekend. I made these for Christmas and they were a huge hit! Do you think this recipe would turn out well using a chocolate cake mix with chocolate chips? 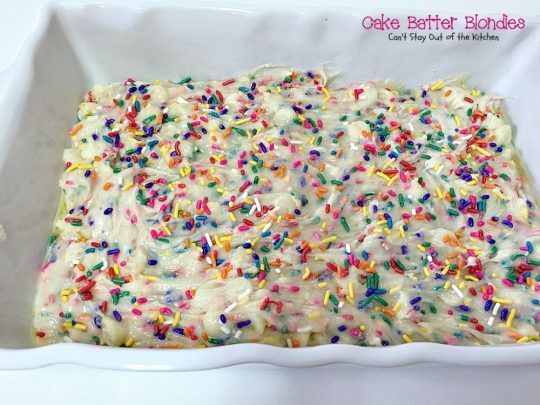 Are the sprinkles optional or will it affect the recipe if you leave them out? 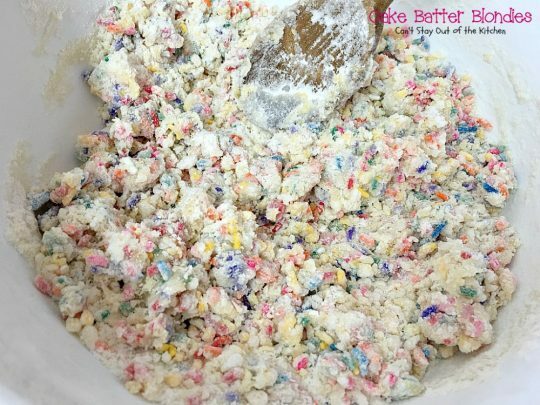 That just gave me an idea on how to use up the big sprinkles I have. I can throw them in cake batter. I knew since I was a kid that that I could use the non-perrielles (sp?) but never thought about these hard big ones they make today would work ok in mix. Thanks for the idea. I bet you could use them in all kinds of cakes, perhaps even certain types of coffeecakes or cobblers, too. You might consider using coconut milk for the milk in the recipe. It’s probably sweeter than almond breeze (almond milk) & would probably work better. I’m not sure about an egg substitute. What do you usually use for egg substitutes? I can check around & see. Another person wrote in that she substitutes applesauce for eggs and oil in recipes. You might try coconut milk for the milk and applesauce for the eggs. It will give it a different taste with the apples, though. These look so good and moist!